What’s in the box: Canon PowerShot S100 Digital Camera (Black), NB-5L Lithium-Ion Battery Pack (3.7v, 1120mAh), CB-2LX Charger for Canon NB-5L Lithium Battery Pack, Wrist Strap WS-DC11, IFC-400PCU USB Interface Cable, Digital Camera Solution CD-ROM, Customer Support Leaflet and 1-Year Limited Warranty.Recording Media: The camera records still images or moving images with stereo audio on SD Memory Cards (2GB or less), SDHC Memory Cards (4GB to 32GB), and SDXC Memory Cards (32GB and higher). The camera has no built-in memory, and no memory card is included with the camera. The Nikon 1 J2 is a compact, CX-format interchangeable lens digital camera with a 10.1 MP CMOS image sensor. It features a 3.0″ LCD display, can snap photos while recording movies in Full HD (1080p), 10 FPS continuous burst shooting, RAW file recording, Motion Snapshot, Smart Photo Selector and superb low-light performance. Includes the 1 NIKKOR VR II 10-30mm f/3.5-5.6 Lens. The Panasonic Lumix DMC-LX5 is a unique compact digital camera offering photo enthusiasts the ideal way for capturing professional-quality photos and High Definition (HD) video. With an ultra-bright F2.0 ultra-wide-angle 24mm Leica DC Vario-Summicron lens, the Lumix LX5 minimizes image distortion, resulting in stunning, true-to-life images with outstanding resolution and detail.The F2.0 lens is twice as bright as a F2.8 lens, making it easy to produce beautiful photos with a soft-focused background thanks to the shallow depth of field provided by the extra light. Feel like a pro with the groundbreaking features of the Nikon 26288 Coolpix S8200 Digital Camera. It draws its power from the 16.1-MP CMOS sensor that captures images in any setting. You can now catch all those memorable moments at the best possible way and enjoy everything in full high-definition quality. It offers you a variety of in-camera effects to produce outputs that suits your preference and it also has an automatic detection feature that captures scenes the way you want it. The COOLPIX L810, with its incredible image quality, great zoom range and ease-of-use, will bring you photographic enjoyment for years to come. The 26x zoom captures high-resolution images, shot after shot for a broad variety of views-22.5mm wide-angle landscapes to 585mm telephoto shots, capturing action near or far. Enhance the moment and start recording HD (720p) movies with stereo sound at the touch of a button. Plus, L810 uses AA batteries, so you’re never waiting for a recharge. ISO Sensitivity: ISO 80-1600,Auto (auto gain ISO 80-1600). Built-in Memory 50MB. Battery Life Details Photo shooting ( Alkaline batteries ), Photo shooting ( Lithium batteries ), Photo shooting ( NiMH batteries ), Video recording – 1.8 hour(s) ( Alkaline batteries ), Video recording – 5.3 hour(s) ( Lithium batteries ), Video recording – 3.2 hour(s) ( NiMH batteries ). 1 Year Limited Warranty. 16.1 Megapixel CMOS sensor 42x Zoom-NIKKOR ED glass lens 3-inch Ultra-high-resolution (921,000 Dot) LCD Full HD (1080p) Movies with Stereo Sound GPS record location information of your pictures and movies 3-inch TFT LCD display.What’s in the box: Nikon Coolpix P510 Digital Camera (Black), EN-EL5 Lithium-Ion Battery (3.7v 1100mAh), Replacement EH-69P AC Adapter Charger, AN-CP21 Strap, UC-E6 USB Cable, EG-CP16 Nikon Audio/Video Cable, LC-CP24 Lens Cap and NikonView NX 2 Software. Simple and stylish, this chic compact camera is packed with advancements that make it easy to get a great shot every time. Smart AUTO recognizes 32 predefined shooting situations, then automatically picks the proper camera settings for you. Saving memories in breathtakingly realistic 720p HD is as easy as pressing the dedicated movie button. 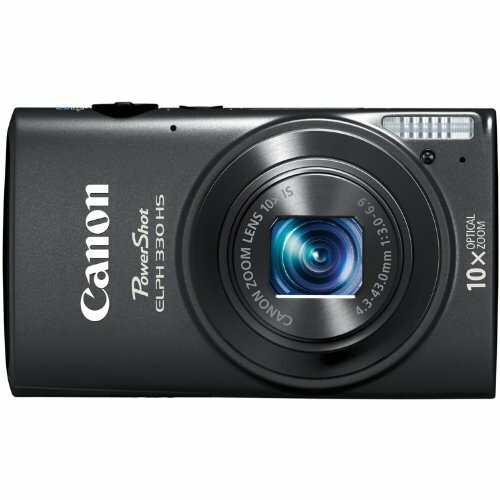 Slim and curvy, the PowerShot ELPH 110 HS is a natural fit for your hand. Easy operability and reliable high-quality performance are reason enough to carry it everywhere, but you’ll also love the attention-getting quality of the camera’s distinctly sophisticated modern design. The matte finish in a wide range of vivid, highly expressive colors projects your taste and style like a fashion accessory, but the PowerShot ELPH 110 HS has its serious side, too. A 16.1 Megapixel high-sensitivity sensor plus Canon’s DIGIC 5 Image Processor deliver impeccable image quality and high-performance features never before possible.